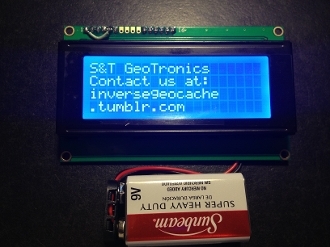 Our simple Geocaching display assembly. This little guy is a full Arduino nano mounted straight to the back of a 2004 LCD. It already has the 9 Volt power connector, but like all our other products, batteries are not included. With 4 lines of text & 20 characters per line, you can involve the Geocacher in an extensive story line.